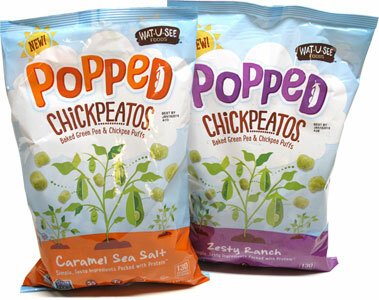 Baked green peas and chickpeas come together in a delicious, vegan ranch flavor to make a craveable snack for everyone. These all-natural puffs are packed with protein and fiber, and popped full of so much bold flavor you'll almost forget that they're good for you! But, once you take a glance at the simple, pure ingredients, you'll definitely know you made the right snacking choice with these tasty puffs. 4 oz. (113g) bags are $3.99 each. From Grace of Scott Depot, West Virginia on 4/27/2018 . These are awesome, love the sweet/salty combination, plus they are low calorie, low sugar and good combination of protein/fiber. I purchased 2 snack size and when I went back for more there was none! Where can these be purchased without ordering? From Janel of Portsmouth, New Hampshire on 10/8/2017 . (Zesty Ranch) These are ridiculous. RIDICULOUS!! The flavor is incredible--slightly tangy and strongly dill, which I love. The texture is light and crunchy. I don't often think "OMG I'm gonna eat this whole bag in one sitting", but with these I nearly did. From Richard Rankin of La Plata, Missouri on 10/4/2017 . I tried the 'zesty ranch' and haven't had Ranch Dressing in 10 years or more, so no idea if it tastes like ranch. But, these are terrific snacks. Crunchy, salty, flavorful, and 3-4 servings a bag. IMO, these are way better than Hippeas.